When I last wrote, I was disappointed with Koh Samui but was determined to make the best of it, moving to a different beach. 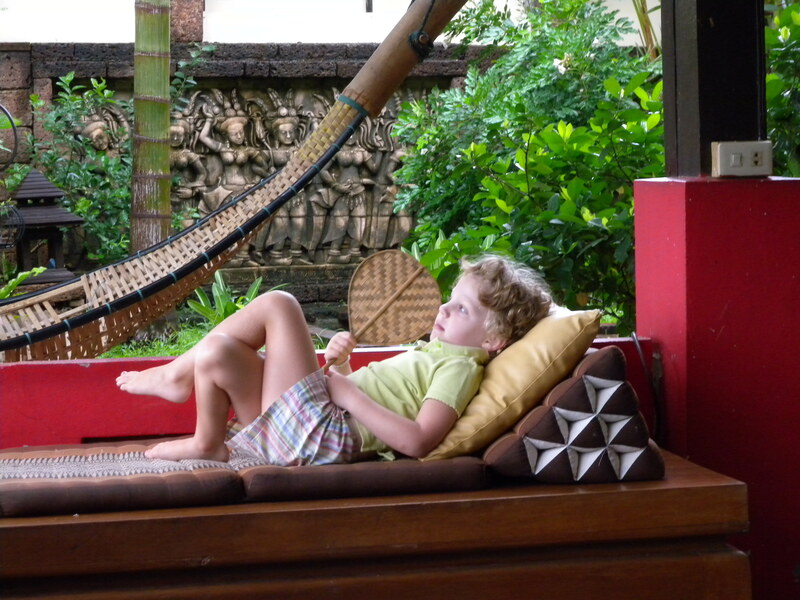 I am happy to report that Ao Thong Ta Kien redeemed Koh Samui for us. 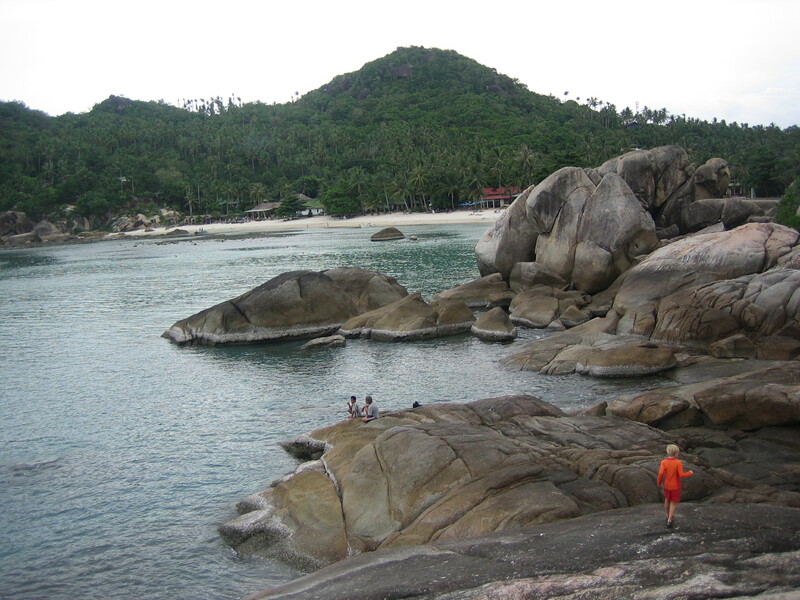 It was a lovely little cove of white sugar-sand, coconut palmtrees, huge gray boulders, a dramatic tide, and steep green hillsides looming over it all. Camilla was adopted by the staff of a massage business; the women preferred to play with their Tuk-Ta than to read their novels or play with their cell phones. 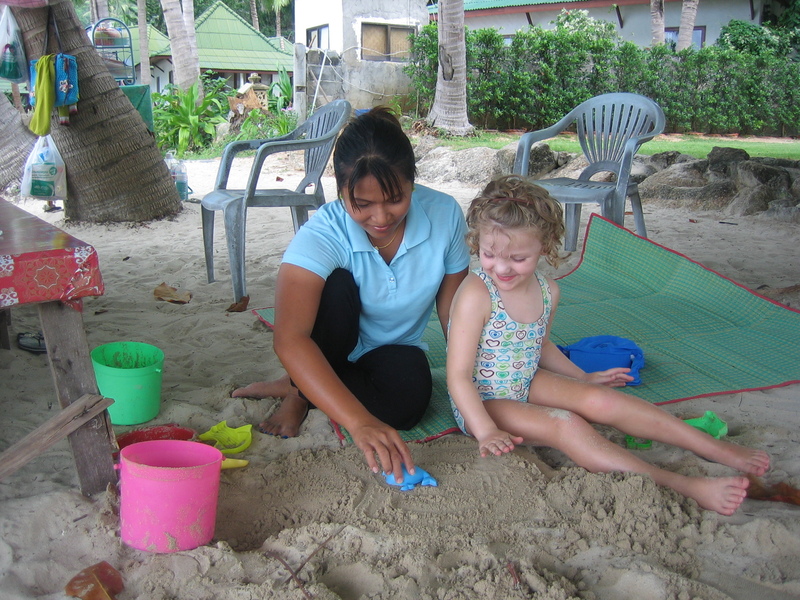 Tuk-Ta herself was only too happy to oblige, sitting on the shade in the shade of the coconut palms, building sand-castles with them, prattling merrily away in English. Ascher went for more active pursuits, like clambering over the boulders, beach football, and swimming. He and I rented a double kayak and poked around some of the big boulders, went out around the end of cove, where it was only us, crabs skittering across the rocks, the ocean, and one white bird dive-bombing us for a while. He sat there for a moment, agape: “I can’t believe I’m kayaking on the ocean, in Thailand!” We pulled up on another beach, privately owned by some high-end resort, but there was not a soul there and the security guard was only too delighted to have company. If you want an adventure, Ascher is a good choice of partner. He understands what is for me, if not for Ken, a central truth: if it’s not a tiny bit dangerous, it’s not all that fun. The flight attendants were very concerned. but both children were able to content themselves with the same copy of the Bangkok Air in-flight magazine they’d looked at during the previous two flights, and pulled out their iPods only in dire straits. They do not fuss, they do not whine, they kick the seat in front of them only occasionally. We saw this minor miracle again when we took them to Lampang the next week, and are so grateful. If only, we thought with some exhaustion, we could just keep them in constant motion until school begins. Lampang is a sleepy town about ninety kilometers from Chiang Mai, where we spent a few nights. We took the train out, which goes over a mountain pass through a national park, and returned by a fancy, air-conditioned private bus (which delighted Ascher to no end). Despite having a goodly amount of charm and a few important temples, it sees very few tourists. The children were, therefore, unusually interesting objects of attention, with swarms of smiling women surrounding them, patting their cheeks, pronouncing them beautiful, greeting them solely for the pleasure of hearing them say “saw-di-ka/kop” back properly. The Thais, to demonstrate affection or interest in a child, will gently squeeze her upper arm, as if to check her muscles. Ascher and Camilla’s arms were squeezed by total strangers, men and women, all day long. They mostly enjoyed themselves, until we were finally leaving and Camilla had had enough and stopped smiling back, turning her face into my body instead. 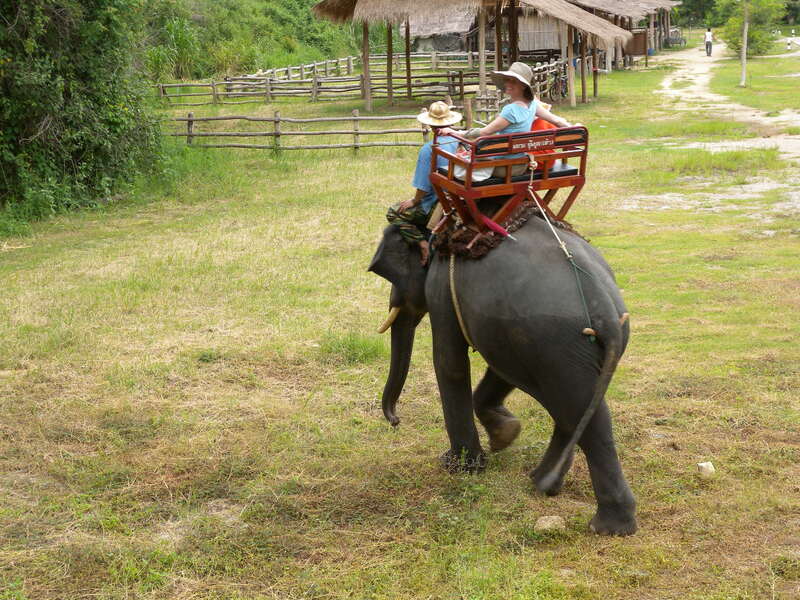 the Thai Elephant Conversation Camp, of which all the other elephant camps are pale and touristy imitations. This is a royal project, which provides a haven for hurt or sick or abandoned elephants, pioneers medical care for them, and houses the royal elephants in their stable. Imagine an enormous tract of jungle, with some of it laid out for visitors, but the rest for them and their mahouts to roam around in, just being elephants. Of course, there was an elephant show (highlight: logging and painting demonstrations) but the best was watching them get bathed up close and personal (Ascher got sprayed). Before they get in the water, you get to just hang out with them, get to know their personalities a bit, and get kissed (they’re very affectionate and happy, being the luckiest elephants in Thailand). 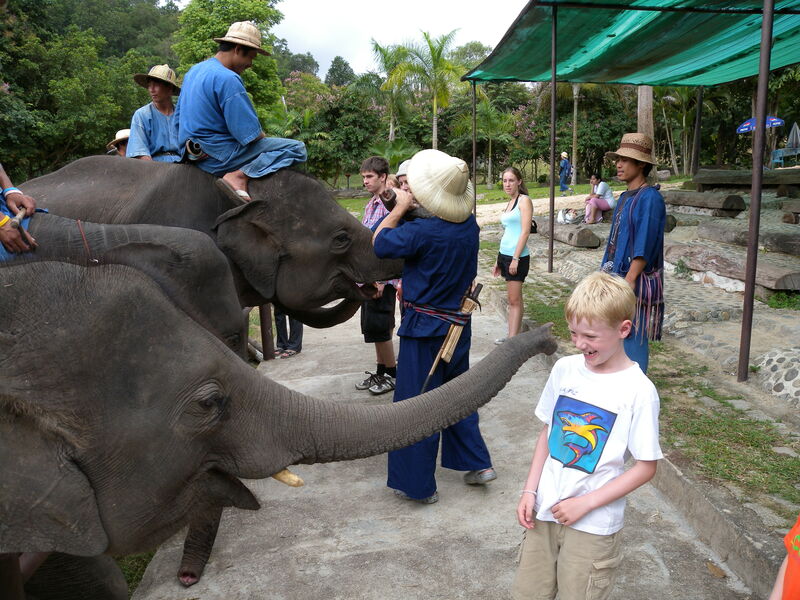 The kids’ favorite was one named “AI,” a baby of three years, who really loved to kiss with his trunk. He is named so because he was created by artificial insemination, of which they are very proud. We rode elephants on a narrow little path scrambling up and down steep hillsides, rocking in our enormous saddles, the mahouts perched on top of the head of the elephants. Our elephant had a dog companion that followed him all through our ride. Both children are madly in love with elephants now. The other highlight in Lampang was a weekend night pedestrian market. These are a new development in Thailand, during which the city shuts down a historic street, and food and handicraft and toy and tchochke vendors come out. We made an entire dinner of snacks we picked up as we wandered, trying all kinds of mysterious and wonderful new things. It was such a joy to be briefly free of the drama of the dinner table. I was perfectly content for the children to eat an ear of roasted corn, and otherwise content themselves on deep-fried tidbits and sweets. The best I found was something pronounced “hairy-POP” which are like tiny samosas with semi-sweet fillings (bean paste, sesame, strawberry, sweetish chicken curry). But the greatest treasure of all was–finally–the deep-fried chili peppers, stuffed with ground pork and breaded, of which I’ve been dreaming for years. I haven’t seen them at any markets around our new neighborhood, and it’s a bit of a haul back to our old one for them. But Ken found them, in all their glory, and they were as good (if not as spicy) as I remembered. Plus, the kids got a serving of a favorite and absurd Thai dessert (white bread toasted with margarine, drizzled with sweetened condensed milk and sprinkled with sugar) from a vendor wearing a Michigan shirt. 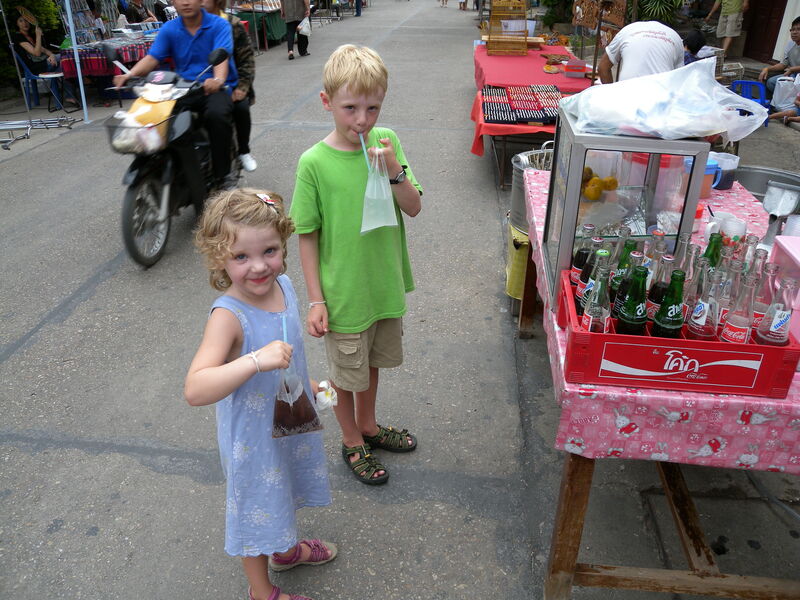 Sweet drinks out of plastic bags are a key part of Thai street life. 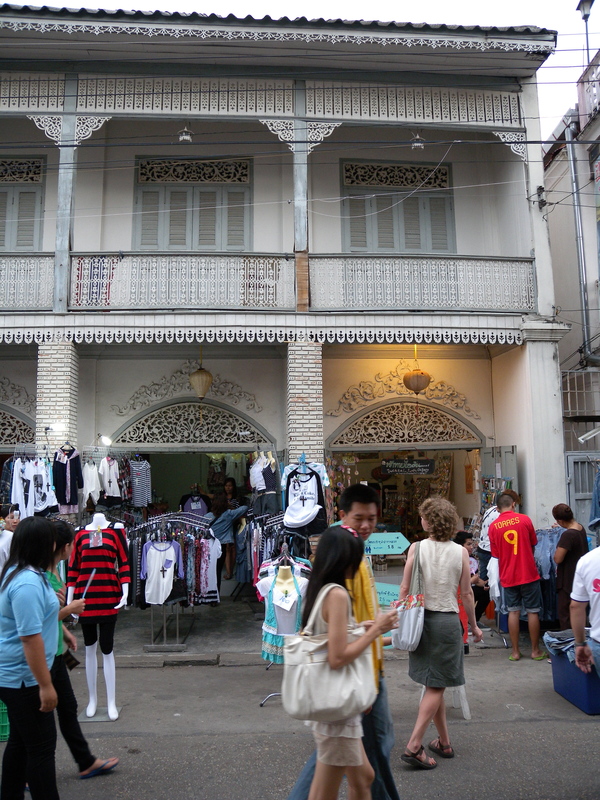 Chinese merchant house, with Mama in front. Photo courtesy of Ascher. It was as if the gods of Thai street food had consigned to create an evening just for me. Ascher has come through the worst of his adjustment. One month ago, we had far more whining and irrationality than pleasure; now the ratio is definitely reversed. He is beginning to keep records of the different vehicles he’s taken so far (and how many times in each, as much as is possible), the multiple languages he’s heard so far (we’re up to 13, counting Pali), and beginning to process the meaning of some of the differences he’s encountered. He’s still greatly troubled by the beggars—is it possible my child is so sheltered he never really saw panhandlers?—and was able to see a real difference in the demeanor of the unhappy elephant he saw begging in the market today and the joyous content of the elephants on Lampang. In Lampang, he also made an enormous leap when he encountered some Thai children during a stop during a horse-drawn carriage ride (Lampang also has this weird Wild West thing going on, but that’s of limited interest). The two boys and the girl, all about ten years old, came up and started playing near where Ascher was, with one girl clearly leading the charge towards this interesting specimen of falang boyhood. Rock Paper Scissors differs only slightly in Thailand. They played a game of rock-paper-scissors to determine who would turn cartwheels in which order, how many cartwheels would be turned, and then who would have to sing a silly song in front of the others. Ascher watched for a while, but there was no explicit invitation to join them. Finally, he sucked up his courage and turned a cartwheel after they turned theirs (and his cartwheels are awful, with him going splat on his back, which tells you how brave he was being). He kept turning them, until slowly he was included into the rock-paper-scissors circle, and, during the silly-song sequence, was paired off with the other boy (who was not going to sing) to do a silly dance while the girls sang. He learned the most important lesson of all: if you really want to experience things in a foreign country, you have to be willing to make a total fool of yourself in public. And you’ll be liked for it. She does enjoy a great deal between temper tantrums. 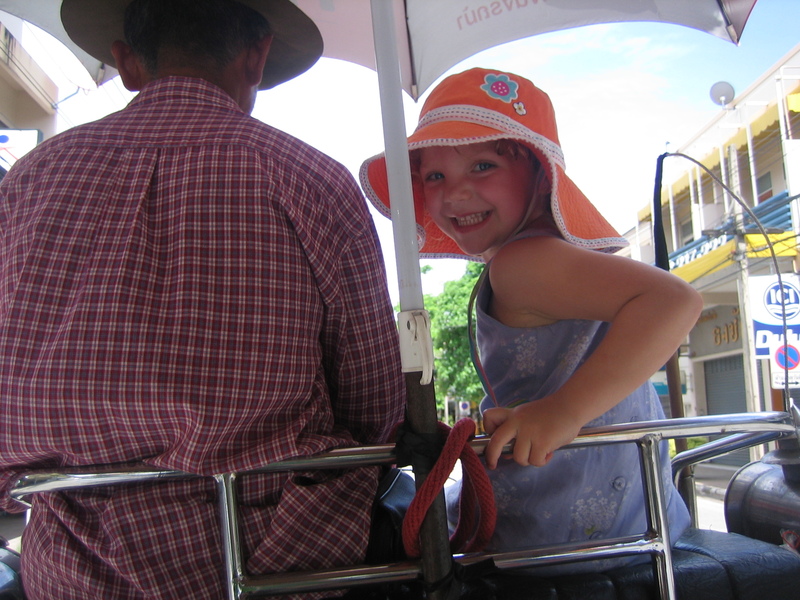 On the horse-drawn carriage in Lampang. explaining everything she sees to you, and the next, she’s screaming at us for not having anticipated some tiny irrational need and crying her eyes out because she wants her Mommy (who is usually kneeling right in front of her, drenched in sweat, wondering desperately if there are any approaches she hasn’t tried yet, outside of a tranquilizer gun). While she, as the younger, is likely to take away the least from this experience, suffice it to say that she’s teaching Ken and me a great deal about patience, and about the mysteries and sacrifices of parenthood. While neither child has miraculously embraced hot and sour curries or dried squid, their dining repertoire expands, slowly. On the beach, they delighted us by eating fried rice without any complaint. Ascher discovered the joys of kam mon gai tawt, a deep-fried fillet of chicken sliced and laid over a bed of specially-dressed rice, and also likes pat siu muu, a dish of thick white rice noodles stir-fried with collards, pork, eggs, and a sweetish dark soy sauce. The various hot-dogs, fish-balls, and meat-balls of Thailand are a hit with both kids, as are (unsurprisingly) the Chinese doughnuts, spring-rolls, and various waffle-like sweets. Camilla, thank God, has decided, like Ascher, to like noodle soup, although she only likes the thin noodles, and will not eat the thick. She also loves my favorite peanuts: deep-fried with dried hot peppers, kefir lime leaves, shallots, and flavored with fish sauce, salt, and sugar. Since they’re both now eating fresh papaya and pomelo and bananas and mangoes, I’ve dispensed with the vitamin supplements I was forcing upon them a few weeks ago. We continue to force them, as we do at home, to try everything, which I do believe does pay off, especially when one of them says, oh! that’s good! While Ken and I yearn to return to the Yunnanese restaurant we used to like (stir-fried grubs, and Yunnan ham! ), we can see the slow and steady progress. No doubt, by the time we’re ready to leave, they’ll be really ready to eat.